The Advisory Committee on Civil Rules submitted proposed amendments to Civil Rules 5, 23, 62, and 65.1, with a recommendation that they be approved and transmitted to the Judicial Conference. The proposed amendments were circulated to the bench, bar, and public for comment in August 2016. The proposed amendments to Civil Rule 5 are part of the inter-advisory committee project to develop rules for electronic filing and service. Proposed amendments to Rule 5(b)(2)(E) address electronic service. The present rule allows electronic service only if the person to be served has consented in writing. The proposal deletes the requirement of consent when service is made on a registered user through the court’s electronic filing system. Written consent is still required when service is made by electronic means outside the court’s system (e.g., discovery materials). Proposed amendments to Rule 5(d) address electronic filing. Present Rule 5(d)(3) permits papers to be filed, signed, or verified by electronic means if permitted by local rule; a local rule may require electronic filing only if reasonable exceptions are allowed. In practice, most courts require registered users to file electronically. Proposed Rule 5(d)(3)(A) recognizes this reality by establishing a uniform national rule that makes electronic filing mandatory for parties represented by counsel, except when non-electronic filing is allowed or required by local rule, or for good cause. Proposed Rule 5(d)(3)(B) addresses filings by pro se parties. Under the proposal, courts would retain the discretion to permit electronic filing by pro se parties through court order or local rule. Any court order or local rule requiring electronic filing for pro se parties must allow reasonable exceptions. While the advisory committee recognizes that some pro se parties are fully capable of electronic filing, the idea of requiring a pro se party to electronically file raised concerns that such a requirement could effectively deny access to persons not equipped to do so. Proposed Rule 5(d)(3)(C) establishes a uniform national signature provision. Commentators found ambiguity in the published language regarding whether the rule would require that the attorney’s username and password appear on the filing. In response, the advisory committee, in consultation with the other advisory committees, made revisions to increase the clarity of this amendment. Finally, the proposal includes a provision addressing proof of service. The current rule requires a certificate of service but does not specify a particular form. The published version of the rule provided that a notice of electronic filing generated by the court’s CM/ECF system constitutes a certificate of service. Following the public comment period, the advisory committee revised the proposal to provide that no certificate of service is required when a paper is served by filing it with the court’s system. The proposal also addresses whether a certificate of service is required for a paper served by means other than the court’s electronic filing system: if the paper is filed, a certificate of service must be filed with it or within a reasonable time after service, and if the paper is not filed, a certificate of service is not required to be filed unless required by local rule or court order. The proposed amendments to Rule 23 are the result of more than five years of study and consideration by the advisory committee, through its Rule 23 subcommittee. As previously reported, the decision to take up this effort was prompted by several developments that seemed to warrant reexamination of Rule 23, namely: (1) the passage of time since the 2003 amendments to Rule 23 went into effect; (2) the development of a body of case law on class action practice; and (3) recurrent interest in Congress, including the 2005 adoption of the Class Action Fairness Act. In developing the proposed amendments to Rule 23, the subcommittee attended nearly two dozen meetings and bar conferences with diverse memberships and attendees. In addition, in September 2015, the subcommittee held a mini-conference to gather additional input from a variety of stakeholders on potential rule amendments. 7. A proposal by the Department of Justice to include in Rule 23(f) a 45–day period in which to seek permission for an interlocutory appeal when the United States is a party. The majority of the comments received during the public comment period for all the proposed Civil Rules amendments—both written and in the form of testimony at three public hearings—addressed the Rule 23 proposals. The advisory committee received some comments urging it to reconsider topics it had determined not to pursue, as well as comments urging it to consider additional topics not previously considered. As to those topics that were included in the proposals published for public comment, most comments addressed the modernization of notice methods and the handling of class member objections to proposed class action settlements. The subcommittee and advisory committee carefully considered all of the comments received. Minor changes were made to the proposed rule language, and revisions to the committee note were aimed at increasing clarity and succinctness. The proposed amendments to Rule 62 and Rule 65.1 are the product of a joint subcommittee with the Advisory Committee on Appellate Rules. The advisory committee received three comments on the proposed amendments, each of which was supportive. Second, the proposed amendments make clear that a judgment debtor can secure a stay by posting continuing security, whether as a bond or by other means, that will last from termination of the automatic stay through final disposition on appeal. The former provision for securing a stay on posting a supersedeas bond is retained, without the word “supersedeas.” The right to obtain a stay on providing a bond or other security is maintained with changes that allow the security to be provided before an appeal is taken and that allow any party, not just an appellant, to obtain the stay. Third, subdivisions (a) through (d) are rearranged, carrying forward with only a minor change the provisions for staying judgments in an action for an injunction or a receivership, or directing an accounting in an action for patent infringement. The Standing Committee voted unanimously to support the recommendations of the Advisory Committee on Civil Rules. Recommendation: That the Judicial Conference approve the proposed amendments to Civil Rules 5, 23, 62, and 65.1 and transmit them to the Supreme Court for consideration with a recommendation that they be adopted by the Court and transmitted to Congress in accordance with the law. On April 26, 2018, the Supreme Court approved amendments to the Federal Rules of Civil Procedure, which will take effect on December 1, 2018. The following rules were updated: Rules 5, 23, 62, and 65.1. The changes are listed below. New text is underlined while deleted text has strike through. The Committee Notes are below each rule change. (1) Required Filings; Certificate of Service. (A) Papers after the Complaint. Any paper after the complaint that is required to be served—together with a certificate of service—must be filed withinno later than a reasonable time after service. But disclosures under Rule 26(a)(1) or (2) and the following discovery requests and responses must not be filed until they are used in the proceeding or the court orders filing: depositions, interrogatories, requests for documents or tangible things or to permit entry onto land, and requests for admission. (ii) if the paper is not filed, a certificate of service need not be filed unless filing is required by court order or by local rule. (B) to a judge who agrees to accept it for filing, and who must then note the filing date on the paper and promptly send it to the clerk. (3) Electronic Filing, and Signing, or Verification. A court may, by local rule, allow papers to be filed, signed, or verified by electronic means that are consistent with any technical standards established by the Judicial Conference of the United States. A local rule may require electronic filing only if reasonable exceptions are allowed. (A) By a Represented Person—Generally Required; Exceptions. A person represented by an attorney must file electronically, unless nonelectronic filing is allowed by the court for good cause or is allowed or required by local rule. (ii) may be required to file electronically only by court order, or by a local rule that includes reasonable exceptions. (C) Signing. A filing made through a person’s electronic-filing account and authorized by that person, together with that person’s name on a signature block, constitutes the person’s signature. (D) Same as a Written Paper. A paper filed electronically in compliance with a local rule is a written paper for purposes of these rules. Subdivision (b). Rule 5(b) is amended to revise the provisions for electronic service. Provision for electronic service was first made when electronic communication was not as widespread or as fully reliable as it is now. Consent of the person served to receive service by electronic means was required as a safeguard. Those concerns have substantially diminished, but have not disappeared entirely, particularly as to persons proceeding without an attorney. The amended rule recognizes electronic service through the court’s transmission facilities as to any registered user. A court may choose to allow registration only with the court’s permission. But a party who registers will be subject to service through the court’s facilities unless the court provides otherwise. With the consent of the person served, electronic service also may be made by means that do not utilize the court’s facilities. Consent can be limited to service at a prescribed address or in a specified form, and may be limited by other conditions. Service is complete when a person files the paper with the court’s electronic-filing system for transmission to a registered user, or when one person sends it to another person by other electronic means that the other person has consented to in writing. But service is not effective if the person who filed with the court or the person who sent by other agreed-upon electronic means learns that the paper did not reach the person to be served. The rule does not make the court responsible for notifying a person who filed the paper with the court’s electronic-filing system that an attempted transmission by the court’s system failed. But a filer who learns that the transmission failed is responsible for making effective service. Because Rule 5(b)(2)(E) now authorizes service through the court’s facilities as a uniform national practice, Rule 5(b)(3) is abrogated. It is no longer necessary to rely on local rules to authorize such service. Subdivision (d). Rule 5(d)(1) has provided that any paper after the complaint that is required to be served “must be filed within a reasonable time after service.” Because “within” might be read as barring filing before the paper is served, “no later than” is substituted to ensure that it is proper to file a paper before it is served. Under amended Rule 5(d)(1)(B), a certificate of service is not required when a paper is served by filing it with the court’s electronic-filing system. When service is not made by filing with the court’s electronic-filing system, a certificate of service must be filed with the paper or within a reasonable time after service, and should specify the date as well as the manner of service. For papers that are required to be served but must not be filed until they are used in the proceeding or the court orders filing, the certificate need not be filed until the paper is filed, unless filing is required by local rule or court order. Amended Rule 5(d)(3) recognizes increased reliance on electronic filing. Most districts have adopted local rules that require electronic filing, and allow reasonable exceptions as required by the former rule. The time has come to seize the advantages of electronic filing by making it generally mandatory in all districts for a person represented by an attorney. But exceptions continue to be available. Nonelectronic filing must be allowed for good cause. And a local rule may allow or require nonelectronic filing for other reasons. Filings by a person proceeding without an attorney are treated separately. It is not yet possible to rely on an assumption that pro se litigants are generally able to seize the advantages of electronic filing. Encounters with the court’s system may prove overwhelming to some. Attempts to work within the system may generate substantial burdens on a pro se party, on other parties, and on the court. Rather than mandate electronic filing, filing by pro se litigants is left for governing by local rules or court order. Efficiently handled electronic filing works to the advantage of all parties and the court. Many courts now allow electronic filing by pro se litigants with the court’s permission. Such approaches may expand with growing experience in the courts, along with the greater availability of the systems required for electronic filing and the increasing familiarity of most people with electronic communication. Room is also left for a court to require electronic filing by a pro se litigant by court order or by local rule. Care should be taken to ensure that an order to file electronically does not impede access to the court, and reasonable exceptions must be included in a local rule that requires electronic filing by a pro se litigant. In the beginning, this authority is likely to be exercised only to support special programs, such as one requiring e-filing in collateral proceedings by state prisoners. A filing made through a person’s electronic-filing account and authorized by that person, together with that person’s name on a signature block, constitutes the person’s signature. (c) Certification Order; Notice to Class Members; Judgment; Issues Classes; Subclasses. (1) Notice to the Class. (A) Information That Parties Must Provide to the Court. The parties must provide the court with information sufficient to enable it to determine whether to give notice of the proposal to the class. (ii) certify the class for purposes of judgment on the proposal. (2) Approval of the Proposal. If the proposal would bind class members, the court may approve it only after a hearing and only on finding that it is fair, reasonable, and adequate after considering whether:. (D) the proposal treats class members equitably relative to each other. (3) Identifying Agreements. The parties seeking approval must file a statement identifying any agreement made in connection with the proposal. (4) New Opportunity to Be Excluded. If the class action was previously certified under Rule 23(b)(3), the court may refuse to approve a settlement unless it affords a new opportunity to request exclusion to individual class members who had an earlier opportunity to request exclusion but did not do so. (A) In General. Any class member may object to the proposal if it requires court approval under this subdivision (e); the objection may be withdrawn only with the court’s approval. The o bjection must state whether it applies only to the objector, to a specific subset of the class, or to the entire class, and also state with specificity the grounds for the objection. (ii) forgoing, dismissing, or abandoning an appeal from a judgment approving the proposal. (C) Procedure for Approval After an Appeal. If approval under Rule 23(e)(5)(B) has not been obtained be fore an appeal is docketed in the court of appeals, the procedure of Rule 62.1 applies while the appeal remains pending. (f) Appeals. A court of appeals may permit an appeal from an order granting or denying class-action certification under this rule, but not from an order under Rule 23(e)(1).if a petition for permission to appeal is filed A party must file a petition for permission to appeal with the circuit clerk within 14 days after the order is entered, or within 45 days after the order is entered if any party is the United States, a United States agency, or a United States officer or employee sued for an act or omission occurring in connection with duties performed on the United States’ behalf. An appeal does not stay proceedings in the 118 district court unless the district judge or the court of appeals so orders. Rule 23 is amended mainly to address issues related to settlement, and also to take account of issues that have emerged since the rule was last amended in 2003. Subdivision (c)(2). As amended, Rule 23(e)(1) provides that the court must direct notice to the class regarding a proposed class-action settlement only after determining that the prospect of class certification and approval of the proposed settlement justifies giving notice. This decision has been called “preliminary approval” of the proposed class certification in Rule 23(b)(3) actions. It is common to send notice to the class simultaneously under both Rule 23(e)(1) and Rule 23(c)(2)(B), including a provision for class members to decide by a certain date whether to opt out. This amendment recognizes the propriety of this combined notice practice. Subdivision (c)(2) is also amended to recognize contemporary methods of giving notice to class members. Since Eisen v. Carlisle & Jacquelin, 417 U.S. 156 (1974), interpreted the individual notice requirement for class members in Rule 23(b)(3) class actions, many courts have read the rule to require notice by first class mail in every case. But technological change since 1974 has introduced other means of communication that may sometimes provide a reliable additional or alternative method for giving notice. Although first class mail may often be the preferred primary method of giving notice, courts and counsel have begun to employ new technology to make notice more effective. Because there is no reason to expect that technological change will cease, when selecting a method or methods of giving notice courts should consider the capacity and limits of current technology, including class members’ likely access to such technology. Rule 23(c)(2)(B) is amended to take account of these changes. The rule continues to call for giving class members “the best notice that is practicable.” It does not specify any particular means as preferred. Although it may sometimes be true that electronic methods of notice, for example email, are the most promising, it is important to keep in mind that a significant portion of class members in certain cases may have limited or no access to email or the Internet. Instead of preferring any one means of notice, therefore, the amended rule relies on courts and counsel to focus on the means or combination of means most likely to be effective in the case before the court. The court should exercise its discretion to select appropriate means of giving notice. In providing the court with sufficient information to enable it to decide whether to give notice to the class of a proposed class-action settlement under Rule 23(e)(1), it would ordinarily be important to include details about the proposed method of giving notice and to provide the court with a copy of each notice the parties propose to use. In determining whether the proposed means of giving notice is appropriate, the court should also give careful attention to the content and format of the notice and, if notice is given under both Rule 23(e)(1) and Rule 23(c)(2)(B), any claim form class members must submit to obtain relief. Counsel should consider which method or methods of giving notice will be most effective; simply assuming that the “traditional” methods are best may disregard contemporary communication realities. The ultimate goal of giving notice is to enable class members to make informed decisions about whether to opt out or, in instances where a proposed settlement is involved, to object or to make claims. Rule 23(c)(2)(B) directs that the notice be “in plain, easily understood language.” Means, format, and content that would be appropriate for class members likely to be sophisticated, for example in a securities fraud class action, might not be appropriate for a class having many members likely to be less sophisticated. The court and counsel may wish to consider the use of class notice experts or professional claims administrators. Attention should focus also on the method of opting out provided in the notice. The proposed method should be as convenient as possible, while protecting against unauthorized opt-out notices. Subdivision (e). The introductory paragraph of Rule 23(e) is amended to make explicit that its procedural requirements apply in instances in which the court has not certified a class at the time that a proposed settlement is presented to the court. The notice required under Rule 23(e)(1) then should also satisfy the notice requirements of amended Rule 23(c)(2)(B) for a class to be certified under Rule 23(b)(3), and trigger the class members’ time to request exclusion. Information about the opt-out rate could then be available to the court when it considers final approval of the proposed settlement. Subdivision (e)(1). The decision to give notice of a proposed settlement to the class is an important event. It should be based on a solid record supporting the conclusion that the proposed settlement will likely earn final approval after notice and an opportunity to object. The parties must provide the court with information sufficient to determine whether notice should be sent. At the time they seek notice to the class, the proponents of the settlement should ordinarily provide the court with all available materials they intend to submit to support approval under Rule 23(e)(2) and that they intend to make available to class members. The amended rule also specifies the standard the court should use in deciding whether to send notice—that it likely will be able both to approve the settlement proposal under Rule 23(e)(2) and, if it has not previously certified a class, to certify the class for purposes of judgment on the proposal. The subjects to be addressed depend on the specifics of the particular class action and proposed settlement. But some general observations can be made. One key element is class certification. If the court has already certified a class, the only information ordinarily necessary is whether the proposed settlement calls for any change in the class certified, or of the claims, defenses, or issues regarding which certification was granted. But if a class has not been certified, the parties must ensure that the court has a basis for concluding that it likely will be able, after the final hearing, to certify the class. Although the standards for certification differ for settlement and litigation purposes, the court cannot make the decision regarding the prospects for certification without a suitable basis in the record. The ultimate decision to certify the class for purposes of settlement cannot be made until the hearing on final approval of the proposed settlement. If the settlement is not approved, the parties’ positions regarding certification for settlement should not be considered if certification is later sought for purposes of litigation. Regarding the proposed settlement, many types of information might appropriately be provided to the court. A basic focus is the extent and type of benefits that the settlement will confer on the members of the class. Depending on the nature of the proposed relief, that showing may include details of the contemplated claims process and the anticipated rate of claims by class members. Because some funds are frequently left unclaimed, the settlement agreement ordinarily should address the distribution of those funds. The parties should also supply the court with information about the likely range of litigated outcomes, and about the risks that might attend full litigation. Information about the extent of discovery completed in the litigation or in parallel actions may often be important. In addition, as suggested by Rule 23(b)(3)(B), the parties should provide information about the existence of other pending or anticipated litigation on behalf of class members involving claims that would be released under the proposal. The proposed handling of an award of attorney’s fees under Rule 23(h) ordinarily should be addressed in the parties’ submission to the court. In some cases, it will be important to relate the amount of an award of attorney’s fees to the expected benefits to the class. One way to address this issue is to defer some or all of the award of attorney’s fees until the court is advised of the actual claims rate and results. Another topic that normally should be considered is any agreement that must be identified under Rule 23(e)(3). The parties may supply information to the court on any other topic that they regard as pertinent to the determination whether the proposal is fair, reasonable, and adequate. The court may direct the parties to supply further information about the topics they do address, or to supply information on topics they do not address. The court should not direct notice to the class until the parties’ submissions show it is likely that the court will be able to approve the proposal after notice to the class and a final approval hearing. Subdivision (e)(2). The central concern in reviewing a proposed class-action settlement is that it be fair, reasonable, and adequate. Courts have generated lists of factors to shed light on this concern. Overall, these factors focus on comparable considerations, but each circuit has developed its own vocabulary for expressing these concerns. In some circuits, these lists have remained essentially unchanged for thirty or forty years. The goal of this amendment is not to displace any factor, but rather to focus the court and the lawyers on the core concerns of procedure and substance that should guide the decision whether to approve the proposal. A lengthy list of factors can take on an independent life, potentially distracting attention from the central concerns that inform the settlement-review process. A circuit’s list might include a dozen or more separately articulated factors. Some of those factors—perhaps many—may not be relevant to a particular case or settlement proposal. Those that are relevant may be more or less important to the particular case. Yet counsel and courts may feel it necessary to address every factor on a given circuit’s list in every case. The sheer number of factors can distract both the court and the parties from the central concerns that bear on review under Rule 23(e)(2). This amendment therefore directs the parties to present the settlement to the court in terms of a shorter list of core concerns, by focusing on the primary procedural considerations and substantive qualities that should always matter to the decision whether to approve the proposal. Approval under Rule 23(e)(2) is required only when class members would be bound under Rule 23(c)(3). Accordingly, in addition to evaluating the proposal itself, the court must determine whether it can certify the class under the standards of Rule 23(a) and (b) for purposes of judgment based on the proposal. Paragraphs (A) and (B). These paragraphs identify matters that might be described as “procedural” concerns, looking to the conduct of the litigation and of the negotiations leading up to the proposed settlement. Attention to these matters is an important foundation for scrutinizing the substance of the proposed settlement. If the court has appointed class counsel or interim class counsel, it will have made an initial evaluation of counsel’s capacities and experience. But the focus at this point is on the actual performance of counsel acting on behalf of the class. The information submitted under Rule 23(e)(1) may provide a useful starting point in assessing these topics. For example, the nature and amount of discovery in this or other cases, or the actual outcomes of other cases, may indicate whether counsel negotiating on behalf of the class had an adequate information base. The pendency of other litigation about the same general subject on behalf of class members may also be pertinent. The conduct of the negotiations may be important as well. For example, the involvement of a neutral or court-affiliated mediator or facilitator in those negotiations may bear on whether they were conducted in a manner that would protect and further the class interests. Particular attention might focus on the treatment of any award of attorney’s fees, with respect to both the manner of negotiating the fee award and its terms. Paragraphs (C) and (D). These paragraphs focus on what might be called a “substantive” review of the terms of the proposed settlement. The relief that the settlement is expected to provide to class members is a central concern. Measuring the proposed relief may require evaluation of any proposed claims process; directing that the parties report back to the court about actual claims experience may be important. The contents of any agreement identified under Rule 23(e)(3) may also bear on the adequacy of the proposed relief, particularly regarding the equitable treatment of all members of the class. Another central concern will relate to the cost and risk involved in pursuing a litigated outcome. Often, courts may need to forecast the likely range of possible classwide recoveries and the likelihood of success in obtaining such results. That forecast cannot be done with arithmetic accuracy, but it can provide a benchmark for comparison with the settlement figure. If the class has not yet been certified for trial, the court may consider whether certification for litigation would be granted were the settlement not approved. Examination of the attorney-fee provisions may also be valuable in assessing the fairness of the proposed settlement. Ultimately, any award of attorney’s fees must be evaluated under Rule 23(h), and no rigid limits exist for such awards. Nonetheless, the relief actually delivered to the class can be a significant factor in determining the appropriate fee award. Often it will be important for the court to scrutinize the method of claims processing to ensure that it facilitates filing legitimate claims. A claims processing method should deter or defeat unjustified claims, but the court should be alert to whether the claims process is unduly demanding. Paragraph (D) calls attention to a concern that may apply to some class action settlements—inequitable treatment of some class members vis-a-vis others. Matters of concern could include whether the apportionment of relief among class members takes appropriate account of differences among their claims, and whether the scope of the release may affect class members in different ways that bear on the apportionment of relief. Subdivisions (e)(3) and (e)(4). Headings are added to subdivisions (e)(3) and (e)(4) in accord with style conventions. These additions are intended to be stylistic only. Subdivision (e)(5). The submissions required by Rule 23(e)(1) may provide information critical to decisions whether to object or opt out. Objections by class members can provide the court with important information bearing on its determination under Rule 23(e)(2) whether to approve the proposal. Subdivision (e)(5)(A). The rule is amended to remove the requirement of court approval for every withdrawal of an objection. An objector should be free to withdraw on concluding that an objection is not justified. But Rule 23(e)(5)(B)(i) requires court approval of any payment or other consideration in connection with withdrawing the objection. The rule is also amended to clarify that objections must provide sufficient specifics to enable the parties to respond to them and the court to evaluate them. One feature required of objections is specification whether the objection asserts interests of only the objector, or of some subset of the class, or of all class members. Beyond that, the rule directs that the objection state its grounds “with specificity.” Failure to provide needed specificity may be a basis for rejecting an objection. Courts should take care, however, to avoid unduly burdening class members who wish to object, and to recognize that a class member who is not represented by counsel may present objections that do not adhere to technical legal standards. Subdivision (e)(5)(B). Good–faith objections can assist the court in evaluating a proposal under Rule 23(e)(2). It is legitimate for an objector to seek payment for providing such assistance under Rule 23(h). But some objectors may be seeking only personal gain, and using objections to obtain benefits for themselves rather than assisting in the settlement-review process. At least in some instances, it seems that objectors—or their counsel—have sought to obtain consideration for withdrawing their objections or dismissing appeals from judgments approving class settlements. And class counsel sometimes may feel that avoiding the delay produced by an appeal justifies providing payment or other consideration to these objectors. Although the payment may advance class interests in a particular case, allowing payment perpetuates a system that can encourage objections advanced for improper purposes. The court-approval requirement currently in Rule 23(e)(5) partly addresses this concern. Because the concern only applies when consideration is given in connection with withdrawal of an objection, however, the amendment requires approval under Rule 23(e)(5)(B)(i) only when consideration is involved. Although such payment is usually made to objectors or their counsel, the rule also requires court approval if a payment in connection with forgoing or withdrawing an objection or appeal is instead to another recipient. The term “consideration” should be broadly interpreted, particularly when the withdrawal includes some arrangements beneficial to objector counsel. If the consideration involves a payment to counsel for an objector, the proper procedure is by motion under Rule 23(h) for an award of fees. Rule 23(e)(5)(B)(ii) applies to consideration in connection with forgoing, dismissing, or abandoning an appeal from a judgment approving the proposal. Because an appeal by a class-action objector may produce much longer delay than an objection before the district court, it is important to extend the court-approval requirement to apply in the appellate context. The district court is best positioned to determine whether to approve such arrangements; hence, the rule requires that the motion seeking approval be made to the district court. Until the appeal is docketed by the circuit clerk, the district court may dismiss the appeal on stipulation of the parties or on the appellant’s motion. See Fed. R. App. P. 42(a). Thereafter, the court of appeals has authority to decide whether to dismiss the appeal. This rule’s requirement of district court approval of any consideration in connection with such dismissal by the court of appeals has no effect on the authority of the court of appeals to decide whether to dismiss the appeal. It is, instead, a requirement that applies only to providing consideration in connection with forgoing, dismissing, or abandoning an appeal. Subdivision (e)(5)(C). Because the court of appeals has jurisdiction over an objector’s appeal from the time that it is docketed in the court of appeals, the procedure of Rule 62.1 applies. That procedure does not apply after the court of appeals’ mandate returns the case to the district court. Subdivision (f). As amended, Rule 23(e)(1) provides that the court must direct notice to the class regarding a proposed class-action settlement only after determining that the prospect of eventual class certification justifies giving notice. But this decision does not grant or deny class certification, and review under Rule 23(f) would be premature. This amendment makes it clear that an appeal under this rule is not permitted until the district court decides whether to certify the class. The rule is also amended to extend the time to file a petition for review of a class-action certification order to 45 days whenever a party is the United States, one of its agencies, or a United States officer or employee sued for an act or omission occurring in connection with duties performed on the United States’ behalf. In such a case, the extension applies to a petition for permission to appeal by any party. The extension recognizes—as under Rules 4(i) and 12(a) and Appellate Rules 4(a)(1)(B) and 40(a)(1)—that the United States has a special need for additional time in regard to these matters. It applies whether the officer or employee is sued in an official capacity or an individual capacity. An action against a former officer or employee of the United States is covered by this provision in the same way as an action against a present officer or employee. Termination of the relationship between the individual defendant and the United States does not reduce the need for additional time. (2) a judgment or order that directs an accounting in an action for patent infringement. (b) Stay by Bond or Other Security. At any time after judgment is entered, a party may obtain a stay by providing a bond or other security. The stay takes effect when the court approves the bond or other security and remains in effect for the time specified in the bond or other security. (2) by the assent of all its judges, as evidenced by their signatures. (d) Stay with Bond on Appeal. If an appeal is taken, the appellant may obtain a stay by supersedeas bond, except in an action described in Rule 62(a)(1) or (2). The bond may be given upon or after filing the notice of appeal or after obtaining the order allowing the appeal. The stay takes effect when the court approves the bond. Subdivisions (a), (b), (c), and (d) of former Rule 62 are reorganized and the provisions for staying a judgment are revised. The provisions for staying an injunction, receivership, or order for a patent accounting are reorganized by consolidating them in new subdivisions (c) and (d). There is no change in meaning. The language is revised to include all of the words used in 28 U.S.C. § 1292(a)(1) to describe the right to appeal from interlocutory actions with respect to an injunction, but subdivisions (c) and (d) apply both to interlocutory injunction orders and to final judgments that grant, refuse, or otherwise deal with an injunction. New Rule 62(a) extends the period of the automatic stay to 30 days. Former Rule 62(a) set the period at 14 days, while former Rule 62(b) provided for a court-ordered stay “pending disposition of” motions under Rules 50, 52, 59, and 60. The time for making motions under Rules 50, 52, and 59, however, was later extended to 28 days, leaving an apparent gap between expiration of the automatic stay and any of those motions (or a Rule 60 motion) made more than 14 days after entry of judgment. The revised rule eliminates any need to rely on inherent power to issue a stay during this period. Setting the period at 30 days coincides with the time for filing most appeals in civil actions, providing a would-be appellant the full period of appeal time to arrange a stay by other means. A 30–day automatic stay also suffices in cases governed by a 60–day appeal period. Amended Rule 62(a) expressly recognizes the court’s authority to dissolve the automatic stay or supersede it by a court-ordered stay. One reason for dissolving the automatic stay may be a risk that the judgment debtor’s assets will be dissipated. Similarly, it may be important to allow immediate enforcement of a judgment that does not involve a payment of money. The court may address the risks of immediate execution by ordering dissolution of the stay only on condition that security be posted by the judgment creditor. Rather than dissolve the stay, the court may choose to supersede it by ordering a stay that lasts longer or requires security. Subdivision 62(b) carries forward in modified form the supersedeas bond provisions of former Rule 62(d). A stay may be obtained under subdivision (b) at any time after judgment is entered. Thus a stay may be obtained before the automatic stay has expired, or after the automatic stay has been lifted by the court. The new rule’s text makes explicit the opportunity to post security in a form other than a bond. The stay takes effect when the court approves the bond or other security and remains in effect for the time specified in the bond or security—a party may find it convenient to arrange a single bond or other security that persists through completion of post-judgment proceedings in the trial court and on through completion of all proceedings on appeal by issuance of the appellate mandate. This provision does not supersede the opportunity for a stay under 28 U.S.C. § 2101(f) pending review by the Supreme Court on certiorari. Finally, subdivision (b) changes the provision in former subdivision (d) that “an appellant” may obtain a stay. Under new subdivision (b), “a party” may obtain a stay. For example, a party may wish to secure a stay pending disposition of post-judgment proceedings after expiration of the automatic stay, not yet knowing whether it will want to appeal. Whenever these rules (including the Supplemental Rules for Admiralty or Maritime Claims and Asset Forfeiture Actions) require or allow a party to give security, and security is given through a bond or other undertaking with one or more suretiessecurity providers, each suretyprovider submits to the court’s jurisdiction and irrevocably appoints the court clerk as its agent for receiving service of any papers that affect its liability on the bond or undertakingsecurity. The surety’ssecurity provider’s liability may be enforced on motion without an independent action. The motion and any notice that the court orders may be served on the court clerk, who must promptly mailsend a copy of each to every suretysecurity provider whose address is known. Rule 65.1 is amended to reflect the amendments of Rule 62. Rule 62 allows a party to obtain a stay of a judgment “by providing a bond or other security.” Limiting Rule 65.1 enforcement procedures to sureties might exclude use of those procedures against a security provider that is not a surety. All security providers, including sureties, are brought into Rule 65.1 by these amendments. But the reference to “bond” is retained in Rule 62 because it has a long history. The word “mail” is changed to “send” to avoid restricting the method of serving security providers. Advisory Committee on Rules of Civil Procedure, Judicial Conference of the United States. The Advisory Committee on Rules of Civil Procedure will hold a meeting on November 7, 2017. The meeting will be open to public observation but not participation. An agenda and supporting materials will be posted at least 7 days in advance of the meeting at: http://www.uscourts.gov/​rules-policies/​records-and-archives-rules-committees/​agenda-books. Thurgood Marshall Federal Judiciary Building, FJC Training Rooms, One Columbus Circle NE., Washington, DC. Rebecca A. Womeldorf, Rules Committee Secretary, Rules Committee Staff, Administrative Office of the United States Courts, Washington, DC 20544, telephone (202) 502-1820. Federal Rule of Civil Procedure 4(m). Civil Rule 4(m) addresses the time limit for service of a summons and was amended in two consecutive years, 2015 and 2016. In addition to shortening the presumptive time for service from 120 days to 90 days, the 2015 amendment added an exemption from the time limit for Rule 71.1(d)(3)(A) notices of a condemnation action. The 2016 amendment added another exemption for Rule 4(h)(2) service on a corporation, partnership, or association at a place not within any judicial district of the United States. The sequential amendments resulted in an error. The 2016 amendment exempting Rule 4(h)(2) was prepared in 2014, before the 2015 amendment exempting Rule 71.1(d)(3)(A) was in effect. Once the 2015 amendment became effective, it should have been incorporated into the proposed 2016 amendment then making its way through the Rules Enabling Act process, but such a revision of the 2016 materials was overlooked. As a result, Rule 71.1(d)(3)(A) was not included in the list of exemptions in Rule 4(m) when the 2016 amendment became effective. The Advisory and Standing Committees unanimously recommend restoring Rule 71.1(d)(3)(A) to the list of exemptions in Rule 4(m) without re-publication. (m) Time Limit for Service. If a defendant is not served within 90 days after the complaint is filed, the court—on motion or on its own after notice to the plaintiff—must dismiss the action without prejudice against that defendant or order that service be made within a specified time. But if the plaintiff shows good cause for the failure, the court must extend the time for service for an appropriate period. This subdivision (m) does not apply to service in a foreign country under Rule 4(f), 4(h)(2), or 4(j)(1), or to service of a notice under Rule 71.1(d)(3)(A). This is a technical amendment that integrates the intended effect of the amendments adopted in 2015 and 2016. (m) Time Limit for Service. If a defendant is not served within 90 days after the complaint is filed, the court–on motion or on its own after notice to the plaintiff–must dismiss the action without prejudice against that defendant or order that service be made within a specified time. But if the plaintiff shows good cause for the failure, the court must extend the time for service for an appropriate period. This subdivision (m) does not apply to service in a foreign country under Rule 4(f), 4(h)(2), or 4(j)(1). Rule 4(m) is amended to correct a possible ambiguity that appears to have generated some confusion in practice. Service in a foreign country often is accomplished by means that require more than the time set by Rule 4(m). This problem is recognized by the two clear exceptions for service on an individual in a foreign country under Rule4(f) and for service on a foreign state under Rule 4(j)(1). The potential ambiguity arises from the lack of any explicit reference to service on a corporation, partnership, or other unincorporated association. Rule 4(h)(2) provides for service on such defendants at a place outside any judicial district of the United States “in any manner prescribed by Rule 4(f) for serving an individual, except personal delivery under (f)(2)(C)(i).” Invoking service “in the manner prescribed by Rule 4(f)” could easily be read to mean that service under Rule 4(h)(2) is also service “under” Rule 4(f). That interpretation is in keeping with the purpose to recognize the delays that often occur in effecting service in a foreign country. But it also is possible to read the words for what they seem to say— service is under Rule 4(h)(2), albeit in a manner borrowed from almost all, but not quite all, of Rule 4(f). The amendment resolves this possible ambiguity. (d) Additional Time After Certain Kinds of Service. When a party may or must act within a specified time after servicebeing served and service is made under Rule 5(b)(2)(C) (mail), (D) (leaving with the clerk), (E), or (F) (other means consented to), 3 days are added after the period would otherwise expire under Rule 6(a). Rule 6(d) is amended to remove service by electronic means under Rule 5(b)(2)(E) from the modes of service that allow 3 added days to act after being served. Rule 5(b)(2) was amended in 2001 to provide for service by electronic means. Although electronic transmission seemed virtually instantaneous even then, electronic service was included in the modes of service that allow 3 added days to act after being served. There were concerns that the transmission might be delayed for some time, and particular concerns that incompatible systems might make it difficult or impossible to open attachments. Those concerns have been substantially alleviated by advances in technology and in widespread skill in using electronic transmission. A parallel reason for allowing the 3 added days was that electronic service was authorized only with the consent of the person to be served. Concerns about the reliability of electronic transmission might have led to refusals of consent; the 3 added days were calculated to alleviate these concerns. Diminution of the concerns that prompted the decision to allow the 3 added days for electronic transmission is not the only reason for discarding this indulgence. Many rules have been changed to ease the task of computing time by adopting 7-, 14-, 21-, and 28-day periods that allow “day- of-the-week” counting. Adding 3 days at the end complicated the counting, and increased the occasions for further complication by invoking the provisions that apply when the last day is a Saturday, Sunday, or legal holiday. Electronic service after business hours, or just before or during a weekend or holiday, may result in a practical reduction in the time available to respond. Extensions of time may be warranted to prevent prejudice. Eliminating Rule 5(b) subparagraph (2)(E) from the modes of service that allow 3 added days means that the 3 added days cannot be retained by consenting to service by electronic means. Consent to electronic service in registering for electronic case filing, for example, does not count as consent to service “by any other means” of delivery under subparagraph (F). What is now Rule 6(d) was amended in 2005 “to remove any doubt as to the method for calculating the time to respond after service by mail, leaving with the clerk of court, electronic means, or by other means consented to by the party served.” A potential ambiguity was created by substituting “after service” for the earlier references to acting after service “upon the party” if a paper or notice “is served upon the party” by the specified means. “[A]fter service” could be read to refer not only to a party that has been served but also to a party that has made service. That reading would mean that a party who is allowed a specified time to act after making service can extend the time by choosing one of the means of service specified in the rule, something that was never intended by the original rule or the amendment. Rules setting a time to act after making service include Rules 14(a)(1), 15(a)(1)(A), and 38(b)(1). “[A]fter being served” is substituted for “after service” to dispel any possible misreading. These rules do not extend or limit the jurisdiction of the district courts or the venue of actions in those courts. An admiralty or maritime claim under Rule 9(h) is governed by 28 U.S.C. § 1390 not a civil action for purposes of 28 U.S.C. §§ 1391-1392. Rule 82 is amended to reflect the enactment of 28 U.S.C. § 1390 and the repeal of § 1392. The Federal Rules of Appellate, Bankruptcy, Civil, and Criminal Procedure have long added three extra days to calculate time periods measured from certain types of service, most notably for service by U.S. mail. For some time, the three extra days have applied to filings served electronically. Each Advisory Committee affected by this convention agrees that the time for treating electronic service like mail service has come and gone. They therefore propose to eliminate the 3-day rule when a party receives service of an item electronically. The resulting package would amend Appellate Rule 26(c), Bankruptcy Rule 9006(f), Civil Rule 6(d), and Criminal Rule 45(c) to eliminate the 3-day rule in cases of electronic service. Each of the amendments works in the same way—with one exception. The proposed amendment to Appellate Rule 26(c) differs slightly because, under current Rule 26(c), application of the 3-day rule depends on whether the paper in question is delivered on the date of service stated in the proof of service. The proposed amendment to Rule 26(c) deems a paper served electronically as delivered on the date of service stated in the proof of service. With the approval of the Standing Committee, all of these amendments were published together. The key concern identified during the public comment period was that this modification of the 3-day rule might create hardships in some settings. The Advisory Committees as a result agreed to add parallel language to each Committee Note recognizing that extensions of time may be warranted to prevent prejudice in certain circumstances. All four Advisory Committees and the Standing Committee unanimously approved the final package of amendments. The proposed amendment to Civil Rule 4(m), the rule addressing time limits for service, corrects an ambiguity regarding service abroad on a corporation. Many practitioners labor under the misimpression that the time for service set forth in Rule 4(m) applies to foreign corporations. This ambiguity arises because two exceptions for service on an individual in a foreign country under Rule 4(f) and for service on a foreign state under Rule 4(j)(1) are clearly referenced, while no such explicit reference is made to service on a corporation. Rule 4(h)(2) provides for service on a corporation at a place not within any judicial district of the United States in a “manner prescribed by Rule 4(f).” It is not clear whether this is service “under” Rule 4(f). The proposed amendment makes clear that the time limit set forth in Rule 4(m) does not include service under Rule 4(h)(2). The Advisory Committee and the Standing Committee unanimously approved the amendment. This proposed amendment to Civil Rule 6(d) substitutes the language “after being served” for “after service.” The purpose of the amendment is to correct a potential ambiguity that was created when the “after service” language was included in the rule when it was amended in 2005. “[A]fter service” could be read to refer not only to a party that has been served but also to a party that has made service. The proposed amendment was published in August 2013, and approved unanimously by the Advisory and Standing Committees in 2014. It was held in abeyance for one year so that it could be submitted simultaneously with the 3-day rule package. This amendment is technical and conforming. Civil Rule 82 addresses venue for admiralty and maritime claims. The proposed amendment arises from legislation that added a new § 1390 to the venue statutes in Title 28 and repealed former § 1392 (local actions). The proposed amendment deletes the reference to § 1391 and to repealed § 1392 and adds a reference to new § 1390 in order to carry forward the purpose of integrating Rule 9(h) with the venue statutes through Rule 82. The Advisory Committee and the Standing Committee unanimously approved the amendment. Below are the proposed rule changes, with those words to be removed noted with a strike through and new words denoted with an underline. (m) Time Limit for Service. If a defendant is not served within 90 days after the complaint is filed, the court—on motion or on its own after notice to the plaintiff—must dismiss the action without prejudice against that defendant or order that service be made within a specified time. But if the plaintiff shows good cause for the failure, the court must extend the time for service for an appropriate period. This subdivision (m) does not apply to service in a foreign country under Rule 4(f), 4(h)(2), or 4(j)(1). Rule 4(m) is amended to correct a possible ambiguity that appears to have generated some confusion in practice. Service in a foreign country often is accomplished by means that require more than the time set by Rule 4(m). This problem is recognized by the two clear exceptions for service on an individual in a foreign country under Rule 4(f) and for service on a foreign state under Rule 4(j)(1). The potential ambiguity arises from the lack of any explicit reference to service on a corporation, partnership, or other unincorporated association. Rule 4(h)(2) provides for service on such defendants at a place outside any judicial district of the United States “in any manner prescribed by Rule 4(f) for serving an individual, except personal delivery under (f)(2)(C)(i).” Invoking service “in the manner prescribed by Rule 4(f)” could easily be read to mean that service under Rule 4(h)(2) is also service “under” Rule 4(f). That interpretation is in keeping with the purpose to recognize the delays that often occur in effecting service in a foreign country. But it also is possible to read the words for what they seem to say—service is under Rule 4(h)(2), albeit in a manner borrowed from almost all, but not quite all, of Rule 4(f). Diminution of the concerns that prompted the decision to allow the 3 added days for electronic transmission is not the only reason for discarding this indulgence. Many rules have been changed to ease the task of computing time by adopting 7-, 14-, 21-, and 28-day periods that allow “day-of-the-week” counting. Adding 3 days at the end complicated the counting, and increased the occasions for further complication by invoking the provisions that apply when the last day is a Saturday, Sunday, or legal holiday. What is now Rule 6(d) was amended in 2005 “to remove any doubt as to the method for calculating the time to respond after service by mail, leaving with the clerk of court, electronic means, or by other means consented to by the party served.” A potential ambiguity was created by substituting “after service” for the earlier references to acting after service “upon the party” if a paper or notice “is served upon the party” by the specified means. “[A]fter service” could be read to refer not only to a party that has been served but also to a party that has made service. That reading would mean that a party who is allowed a specified time to act after making service can extend the time by choosing one of the means of service specified in the rule, something that was never intended by the original rule or the amendment . Rules setting a time to act after making service include Rules 14(a)(1), 15(a)(1)(A), and 38(b)(1). “[A]fter being served” is substituted for “after service” to dispel any possible misreading. 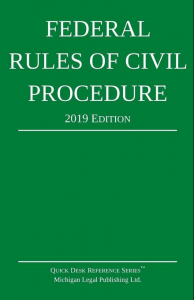 The print edition of the 2016 Federal Rules of Civil Procedure has been released and is now available at all book retailers, including Amazon.com. The cover price is $18.50, but Amazon often discounts the price 10-15% or more. Click here to order. The print edition includes the rules as well as supplementary statutory sections for the current law on venue, jurisdiction, and removal from state courts. Stay up to date. Order the 2016 Federal Rules of Civil Procedure online now. December is coming up fast and that means the 2016 Edition of the Federal Rules of Civil Procedure will come into effect on December 1, 2015. We previously posted an article with a summary of the changes, so be sure to check that out for more detail. This web site will be updated on December 1 with the Rules changes. The process of initiating a lawsuit is sped up. In the previous rules, a plaintiff had 120 days to serve the defendant with the summons and complaint. The new version of Rule 4(m) reduces that time to just 90 days. The court has the option of dismissing the case if the plaintiff has not served the defendant in that period of time. In addition, the court must now issue a scheduling order within 60 days of the defendant being served, which is down from the previous 90 days. See rule 16(b)(2). Discovery can start sooner too. According to the new Rule 26(d)(2), requests for production can be served 21 days after the defendant is served with the summons and complaint, even if the Rule 26 scheduling conference hasn’t been held yet. Failure to preserve Electronically Stored Information. Previously, the court had wide discretion to punish the failure to preserve ESI, but the 2016 amendments more clearly define the potential consequences. The amended Rule 37(e)(1) provides the court with a variety of remedies to address failures to preserve ESI that “should have” been maintained, including “measures no greater than necessary to cure” the loss of ESI or resulting prejudice. Miscellaneous. The section of the rules (Appendix of Forms) that contained sample forms has been removed, as has Rule 84, which referred to that Appendix. The forms will simply be posted on the US Courts web site. We also recommend the United States Courts Archive web site for access to millions of federal court filings and cases. On April 29, 2015, the US Supreme Court released the 2015-2016 amendments to the Federal Rules of Civil Procedure that will take effect on December 1, 2015.
and proportional use of procedure. Rule 4 (with forms) – The presumptive time for serving a defendant is reduced from 120 days to 90 days. This change, together with the shortened times for issuing a scheduling order set by amended Rule 16(b)(2), will reduce delay at the beginning of litigation. has been served, or 60 days (not 90 days) after any defendant has appeared. Rule 26 – The present amendment restores the proportionality factors to their original place in defining the scope of discovery. This change reinforces the Rule 26(g) obligation of the parties to consider these factors in making discovery requests, responses, or objections. Rule 30 – Rule 30 is amended in parallel with Rules 31 and 33 to reflect the recognition of proportionality in Rule 26(b)(1). Rule 31 – Rule 31 is amended in parallel with Rules 30 and 33 to reflect the recognition of proportionality in Rule 26(b)(1). Rule 33 – Rule 33 is amended in parallel with Rules 30 and 31 to reflect the recognition of proportionality in Rule 26(b)(1). Rule 34 – Several amendments are made in Rule 34, aimed at reducing the potential to impose unreasonable burdens by objections to requests to produce. Rule 37 – Rule 37(a)(3)(B)(iv) is amended to reflect the common practice of producing copies of documents or electronically stored information rather than simply permitting inspection. This change brings item (iv) into line with paragraph (B), which provides a motion for an order compelling “production, or inspection.” Subdivision (e). Present Rule 37(e), adopted in 2006, provides: “Absent exceptional circumstances, a court may not impose sanctions under these rules on a party for failing to provide electronically stored information lost as a result of the routine, good-faith operation of an electronic information system.” This limited rule has not adequately addressed the serious problems resulting from the continued exponential growth in the volume of such information. Federal circuits have established significantly different standards for imposing sanctions or curative measures on parties who fail to preserve electronically stored information. These developments have caused litigants to expend excessive effort and money on preservation in order to avoid the risk of severe sanctions if a court finds they did not do enough. New Rule 37(e) replaces the 2006 rule. It authorizes and specifies measures a court may employ if information that should have been preserved is lost, and specifies the findings necessary to justify these measures. It therefore forecloses reliance on inherent authority or state law to determine when certain measures should be used. The rule does not affect the validity of an independent tort claim for spoliation if state law applies in a case and authorizes the claim. Rule 55 – Rule 55(c) is amended to make plain the interplay between Rules 54(b), 55(c), and 60(b). A default judgment that does not dispose of all of the claims among all parties is not a final judgment unless the court directs entry of final judgment under Rule 54(b). Until final judgment is entered, Rule 54(b) allows revision of the default judgment at any time. The demanding standards set by Rule 60(b) apply only in seeking relief from a final judgment. Rule 84 (abrogated) – Rule 84 was adopted when the Civil Rules were established in 1938 “to indicate, subject to the provisions of these rules, the simplicity and brevity of statement which the rules contemplate.” The purpose of providing illustrations for the rules, although useful when the rules were adopted, has been fulfilled. Accordingly, recognizing that there are many alternative sources for forms, including the website of the Administrative Office of the United States Courts, the websites of many district courts, and local law libraries that contain many commercially published forms, Rule 84 and the Appendix of Forms are no longer necessary and have been abrogated. The abrogation of Rule 84 does not alter existing pleading standards or otherwise change the requirements of Civil Rule 8. Appendix of forms (abrogated) – Abrogation of Rule 84 and the other official forms requires that former Forms 5 and 6 be directly incorporated into Rule 4. 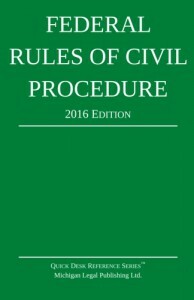 We will update www.federalrulesofcivilprocedure.org on December 1, when the amendments take effect. (1) Hours. The clerk’s office — with a clerk or deputy on duty — must be open during business hours every day except Saturdays, Sundays, and legal holidays. But a court may, by local rule or order, require that the office be open for specified hours on Saturday or a particular legal holiday other than one listed in Rule 6(a)(6)(A). FRCP 77 has been updated on this site with this change as of December 1, 2014.